How to Make Bourbon Marshmallows ~ plush vanilla bean marshmallows spiked with bourbon for an adult spin. 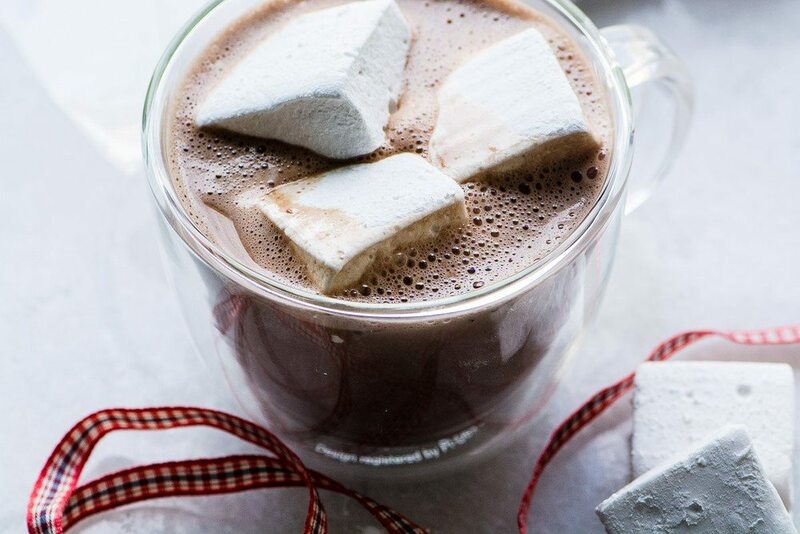 Add them to hot cocoa for an indulgent nightcap. Line a 9x13 baking pan with parchment paper, leaving overhanging paper on the ends so you can easily lift out the marshmallows after they've firmed up. Brush the paper LIGHTLY with oil so the marshmallows won't stick. In the bowl of a stand mixer fitted with the whisk attachment, put 1/2 cup water and 1/4 cup bourbon. Sprinkle the gelatin over it and let it sit. Add the vanilla bean seeds on top. In a medium saucepan, put the sugar, corn syrup, and salt. Begin heating it, stirring to dissolve the sugar. Then stop stirring and let the sugar syrup come up to 238 degrees F, which is the soft ball stage in candy making. It will boil for a while before it gets there. Turn the mixer on low, and let it blend the gelatin for a few seconds, then slowly pour the hot syrup into the gelatin. When it's all in, gradually increase the speed until it is on high. Be careful because the mixture is very hot, and you don't want to get splattered. Beat on high for 12 minutes until the mixture is stiff. Beat in the vanilla. Scrape the mixture into the prepared dish, smoothing it out evenly with an offset spatula. Turn out the marshmallow block onto a surface coated with confectioner's sugar. Peel off the paper and dust the whole top surface with more confectioner's sugar. Use a strainer to sift the sugar down on the marshmallow. Spice the marshmallows into squares using a sharp, oiled knife or pizza cutter. As you cut each strip, turn it to coat the cut ends with sugar, and as you cut each individual marshmallow, do the same. All the sides should be well coated and not sticky. Store marshmallows at room temperature in an airtight container or pack in cellophane bags for giving. They will last about a month.